Canada - BlackBerry is buying a privately held German firm that specializes in voice and data encryption, it said on Tuesday, in a bid to burnish its credentials with highly security-conscious clients like government ‎agencies. The Waterloo, Ontario-based smartphone maker did not disclose the terms of its deal to acquire Secusmart GmbH, which specializes in encryption and anti-eavesdropping services for governments, companies and telecommunications service providers. The acquisition is the latest by the smartphone pioneer to build on niche areas in an attempt to reinvent itself under new Chief Executive John Chen and recover ground ceded to Apple’s (AAPL.O) iPhone and Samsung Electronics Co’s (005930.KS) Galaxy devices. Chen wants to remain a competitor in the smartphone segment, but is focused on building on BlackBerry’s strong mobile device management abilities by beefing up its security and corporate app offerings. Secusmart’s technology is currently being used to protect the devices of government officials in both Canada and Germany, including the BlackBerry device used by German Chancellor Angela Merkel in the wake of the U.S. spying scandal last year. “Everybody wants to talk about eavesdropping, but it really isn’t just that. Both governments and enterprises are now more and more focused on security in the mobile world,” said Chen in an interview, adding that the Secusmart deal gives BlackBerry yet another leg up on the competition in relation to device security. Besides the new line of BlackBerry 10 devices, Secusmart’s technology is also used to secure the landline phones of both corporations and government agencies. BlackBerry said its acquisition of Secusmart underscores its commitment to being the leader in mobile security. Chen said the company, which has gone through a rough and extended restructuring process over the last two years, will be soon getting back on a growth footing with the last of its lay-offs likely to be completed by the end of July. 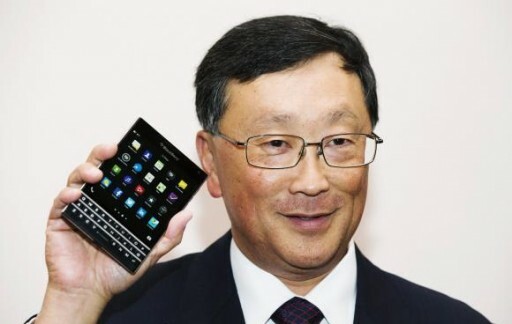 Chen said he expects the company to show revenue growth midway through the next calendar year after the firm rolls out its upcoming Passport and BlackBerry Classic devices, and an updated version of its mobile device management software.